I don’t know how many times I’ve said that the brain is almost 80 percent fat. A lot, for sure. But clearly, it bears repeating. And it’s a big reason why I have always had a hard time advocating low-fat diets, especially for children. When I first started practicing complementary medicine, we were in the low-fat-obsessed era–it didn’t make sense to me then and it certainly doesn’t make any better sense now. The “experts” kept (and continue to keep) making recommendations to follow low-fat diets, despite a lack of solid evidence to prove they work. Well, at least we have copious research on our side now that shows fat isn’t the enemy (though a number of the researchers still tend to stare with disbelief at their own findings). Including the following new study that shows adding nuts and olive oil to a Mediterranean diet could protect cognitive function in older adults. First of all, isn’t the Mediterranean diet filled with nuts and olive oil simply by definition? And of course, the Hamptons Diet makes it even better by replacing the olive oil with macadamia nut oil. But regardless, this study showed that adding nuts to the Mediterranean diet boosted memory, while supplementing the diet with extra-virgin olive oil improved global and frontal cognition. Researchers conducted this analysis on a subgroup of the PREDIMED study. Researchers set out to compare the cardiovascular effects of the Mediterranean diet with added mixed nuts or olive oil to the effects of a low-fat diet. The participants in the study were at high risk of heart disease. They had a mean age of 66 along with type 2 diabetes or at least three of the following cardiovascular risk factors: smoking, hypertension, dyslipidemia (high levels of cholesterol or blood lipids), overweight or obesity, and family history of early-onset coronary heart disease. Those in the olive oil group received 1 liter of olive oilper week. Those in the nuts group got 30 grams (around 1 oz.) of mixed nuts per day (walnuts, hazelnuts, and almonds). The control group received advice to follow a low-fat diet. Researchers then analyzed cognitive function scores for three categories: memory, frontal functions (which included a range of memory and attention tests), and global cognition. 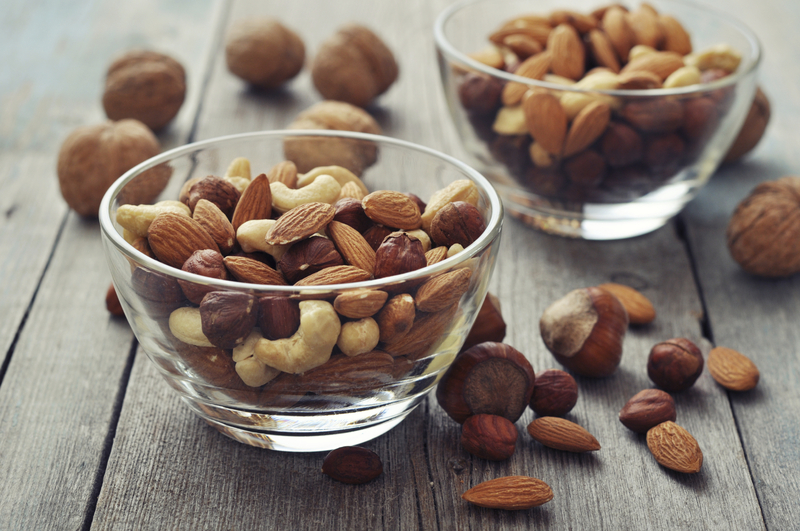 The scores for all three were higher in the group receiving the Mediterranean diet plus nuts vs. the low-fat “control” group. And the people in the olive oil group had higher frontal and global cognition scores than the control group’s. The authors noted that the Mediterranean diet reduced the incidence of cardiovascular disease by 30 percent compared with the control diet in the original PREDIMED study. In addition, stroke risk was reduced by 34 percent in the olive oil group and by 49 percent in the nuts group. The diets also lowered blood pressure and diabetes risk. Then the researchers came up with their reasons why they think nuts and olive oil work so well. And it’s exactly what I’ve been telling you for years. It’s the antioxidant and anti-inflammatory elements of these foods, and their ability to reduce oxidative stress that, over time, can impair cognitive function. The polyphenols, which improve blood flow to the brain–among many other benefits–are a boon here, too. MRI studies have found a strong beneficial effect of this diet on cerebral white matter (that’s the part of the brain that changes first with dementia). Even though these folks are recognizing what I’ve been talking about for a long time, I’m happy that, at least, it’s offering me another chance to bring up the subject. Boosting your brain health takes a focus on healthy living: regular exercise (I’m just talking walking) and eating a high-protein, low-carb diet (i.e., the Hamptons diet). But, beyond that, I’ve offered a number of solutions for managing your brain health. Actually, micromanaging it. On that front, I want to call your attention to a recent Logical Health Alternatives newsletter article I wrote last month, called “The secret, sinister cause of brain breakdown: And how to stop it before it starts”. Subscribers to my monthly newsletter can view it in the archives online. If you’re not yet a subscriber, you can sign up here today. There’s plenty more about brain health on the site, too. Search the drpescatore.com archives for “brain health,” “dementia,” and a number of related keywords and you’ll find plenty of easy-to-incorporate tips for keeping your thinker in tip-top shape. Mediterranean Diet and Age-Related Cognitive Decline: A Randomized Clinical Trial. JAMA Internal Medicine, Published online May 11, 2015.